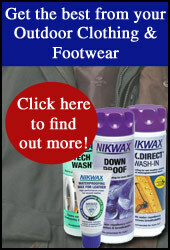 Nikwax cleaning products clean and enhance the life span of your clothing, footwear and equipment. No matter how careful we are, we always seem to get wet and muddy when out walking or working. Nikwax cleaning products allows you to wash your clothing without compromising the performance of the garment. Using the waterbased treatment will ensure your clothing and footwear remains clean, breathable and last longer. Look at for the green cap!